Jen, a T-Rex and the center of the controversy in “Dry Bones,” is the largest specimen of its type ever found and it shows up in Sheriff Walt Longmire’s county. Longmire deals with all kinds of victims, but a dinosaur? That’s a new kind of cold case. A skeleton of this importance would be a windfall for the local museum, but first Longmire must figure out if the High Plains Dinosaur Museum has the right to claim Jen as its own. When the Cheyenne owner of the ranch where Jen was found turns up dead, things get complicated. It’s possible that the T-Rex belongs to the Cheyenne Nation…or the federal government…or the family of the guy who died. Tribal rights, family inheritance, federal property or just a really nice set of bones to display? An acting Deputy Attorney is out to make a name for himself and seems to feel that photo ops are more important than catching the bad guys or finding kidnap victims. But, he’s not the only one with priorities a tad off center in "Dry Bones." More people are interested in who gets the dinosaur than the circumstances behind the death of Danny Lone Elk. With Jen crowding Walt’s holding cells while ownership is being determined, and the interested parties holding Walt’s office hostage, the Sheriff realizes that the only way he can get back to the business for which he was elected is to solve the mystery of Danny Lone Elk’s death and find the gal (also Jen) who discovered the T-Rex to begin with. There are helicopter forays into the back country, harrowing visits to an old mine, entertaining interactions with ever wise-cracking Lucien, Henry Standing Bear saving the day as only he can, and more near misses for Walt than our hearts can stand. Did I mention bullets flying? And the terrifying prospect of Walt taking care of his grand-daughter? He’s not afraid of many bad guys, but the little one? Waaay too funny. We are treated to Craig Johnson’s dry wit, in several LOL scenes, with Walt’s delivery always perfectly timed. A man of few words, but good ones. In real life, that entire region of the country is an active dinosaur bone recovery area with several universities and museums conducting legitimate digs. People love a cool dinosaur, so finding the big ones can cement the reputation – and therefore the funding – of an institution for many years. In “Dry Bones,” Johnson explores the ethics of taking artifacts away from the people upon whose land they were found. It’s not just dino bones that are being removed from their place of origin. World-wide, governments are seeking to recover long lost treasures robbed from centuries old graves, temples, and ruins. Find the treasures? Great. Remove them from the place of origin without permission or proper compensation? These days, that’s a long jail term in the making. Read Craig Allen Johnson’s Author Profile here. Read the review of “The Cold Dish” here. Read the review of “Kindness Goes Unpunished” here. Please visit www.craigallenjohnson.com for lots of information about Mr. Johnson and his work, his future appearances, and his online store. The Walt Longmire character that Craig Allen Johnson has brought to life both in award-winning books and on TV, has come to personify the modern Western law man – rough, tough, and ready for whatever the bad guys can throw at him. Somehow, I had not realized that the show was based on Johnson’s books until the first season was half over. Books? Well, I ran right out – really – and bought the books that my local store had in stock. I started with Cold Dish and was forever hooked. I watched the Longmire series on A&E until somebody in the network offices lost their collective minds and cancelled the show because the demographic didn’t fit their model of the future. Say what? A successful show that millions of people watch, that is making your corporation money and you don’t like the people who are doing the watching? Hmph. Well, we fans are not a dumb bunch and we mounted a social media campaign for another network to pick up the show. Netflix and the Johnson people were able to come to an agreement and the fans collectively smiled. It has been reported that the Netflix association may come to an end after Season 6, but we still have the fabulous bestselling books – with more to come. Craig Johnson was born in West Virginia, but wound up in Wyoming some years after a visit while delivering horses. He built the 2,000+ square foot log cabin in which he and his wife, Judy, now live. Ucross, Wyoming is sparsely populated – a mere 25 inhabitants – and is the source for Johnson’s twitter handle: @ucrosspop25. What makes Sheriff Walt Longmire so immediately likable? Middle-aged, experienced at his job, widower of a woman he loved more than life itself, an attorney daughter of whom he is so very proud, and a Cheyenne best friend/sidekick whom he has known since childhood. Longmire mostly follows the rules, but when justice is in question, the rules are sometimes open to interpretation. The stories are full of wonderful dialogue, intriguing mysteries, life and death situations, and a core set of characters with whom you’d like to spend as much time as possible. Johnson’s obvious love of the wide-open spaces of Wyoming spills onto the pages when the landscape becomes a character, as suddenly dangerous as any killer could be or as mesmerizing as a beautiful painting. The books have been credited as having one of the best depictions of Native American/White Man interactions in the world of fiction – they certainly ring true in the reading. Johnson’s ranch is right next to a Cheyenne reservation, and through the years he has come to respect the challenges that Native Americans have faced and continue to face. His books explore the cultural differences and celebrate the traditions in thoughtful and meaningful ways, often including those themes in the mysteries. When not writing the Longmire series, consulting on the TV show, or working his ranch, Johnson travels around the country (and to France) with Judy, doing book tours. I met him in Raleigh, NC at Quail Ridge Books. He’s charming and as funny in person as you would hope him to be after having read the books. Check out www.craigallenjohnson.com, where you will find details about his upcoming tours, the online fan store with lots of Longmire goodies, and photos of the cast of Longmire. *Photo of Craig Allen Johnson taken by Patti Phillips at Quail Ridge Books in Raleigh, NC. When considering “Kindness Goes Unpunished” for my next book to read and review, the fact that Craig Johnson included a road trip to Philadelphia cinched the decision for me. Philly may have the best cheese steak sandwiches in the world, and some great universities, but it also has a mean street or two. There’s a quote near the beginning of the book: "Philadelphia, where no good deed goes unpunished…” (Steve Lopez, The Philadelphia Inquirer) that sets the tone for the case in this third book in the Walt Longmire series. “Kindness Goes Unpunished” opens with an elementary school classroom scene – Walt is doing his bit in a pre-election campaign stop. He is most comfortable chasing the bad guys and getting justice for the victims in fictional Absaroka County, but when he faces twenty-three 5 year olds, he is decidedly out of his element. Brutal questions and critiques about his reading-aloud skills strike fear in his heart, making him long for backup. It’s a LOL funny scene for any reader who works with young children and Johnson is pitch perfect with both the children and Longmire’s reactions. Why would Walt leave the safety of Wyoming to visit Philadelphia, the supposed City of Brotherly Love? His best friend, Henry Standing Bear, has been asked to lecture about his collection of photographs at a prestigious Fine Arts Academy and Walt decides to tag along, visit his daughter, Cady, and get a look at the new boyfriend. Sounds much simpler than it turns out to be, because the first time Walt actually sees his daughter, she’s in intensive care at a Trauma Center. The case central to the story is complex and dangerous, the bad guys are mean, arrogant and devious, the cover-ups clever, and we are not sure which people can be trusted. With Cady near death, Walt is pushed to the breaking point with worry. We feel the distress that a parent would have when facing the possible loss of a child, no matter how old that child is. His anger is palpable and he puts it to work to discover the multi-layered truth about Cady’s accident. Vic Moretti, Longmire’s deputy, is from Philadelphia and her family wants to touch base with him and Cady during the visit. The Moretti crew is in law enforcement, and is readily supportive when things go south for the Wyoming contingent. The dynamic between Walt and Vic shifts in an interesting way after she arrives in town (in response to him being unreachable) and Walt’s mental reaction to that shift may be the best line quickly capturing a character’s feelings that I’ve read in a while. Johnson continues to explore the human condition with the core characters in the series. Their frailties are understandable and their quirks believable, and they all have differing strengths upon which Walt relies. We ache as they struggle and cheer when they triumph. We may not be in Wyoming for much of the book, but in “Kindness Goes Unpunished,” Johnson still places us in living, breathing surroundings. He nails the feel of the Philly neighborhoods, with their pubs and noise and people still on the street late at night. If you’ve ever visited Philadelphia, you will enjoy the many references to famous landmarks. The "Longmire" TV show is no longer affiliated with the A&E television network (because of a shift in network policy) and as of this writing (September, 2014) is looking for a new home. Please check in at www.craigallenjohnson.com for information about the rest of the Longmire series of books, where you can catch Johnson out on the trail, and even a store that stocks Longmire goodies. My review of Craig Johnson’s “The Cold Dish” can be read here. When a novel begins with, “Bob Barnes says they got a dead body out on BLM (Bureau of Land Management) land,” you’d be sure that murder was afoot. 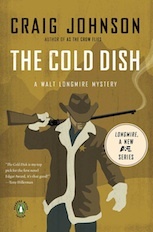 But in "The Cold Dish," Walt Longmire, Sheriff of Absaroka County, thinks the drunken hunters merely saw a dead sheep. The Sheriff is told to bring beer when he goes out to investigate. So, he does what any seasoned Sheriff would do – he manipulates his bored, testy, always swearing, deputy Vic (short for Victoria) to head out to the sheep in question, heads home early and keeps the six-pack. But, his thoughts as he sits in his ‘under construction’ house, are never far from the job, even as he polishes off the Rainier by himself. He doesn’t need a file in front of him to remember the details of one horrific event when justice was not served. The racially charged case that troubles him involves a young Indian girl with Fetal Alcohol Syndrome who had been raped three years before, but her case had only recently come to trial. He muses over injustice in the world, and what he, as the investigating officer on the case, might have done differently. Then Vic reports that the dead body found among the sheep is one of the alleged rapists. Melissa Little Bird’s attackers received a slap on the wrist, but is someone making up for the lapse in the law? When the second of Little Bird’s attackers is killed, Longmire and his lifelong friend, Henry Standing Bear, owner of the local watering hole and Walt’s occasional liaison with the Reservation, must choose whom to protect. What follows is an extremely well written modern Western mystery, with honest dialogue, and complex, realistic characters dealing with serious issues in a harsh world. Friend and foe alike are under suspicion as the cases develop and overlap next to the Northern Cheyenne Reservation, in sight of the breathtaking Bighorn Mountains. A century of distrust among the area residents is not helped by the deaths or the investigations. Johnson has accurately portrayed the hollowness of being a widower, the severity of an unforgiving winter that impedes pursuits, the challenge of forensic analysis without a lab close by, the search for a 125 year old .45-70 Sharpe’s Buffalo rifle, the emptiness of having an estranged daughter, and the issue of an upcoming election for Sheriff. This multi-dimensional background to the central story creates an absorbing introduction to the Longmire series of novels. Johnson now lives on a ranch in Wyoming and was a law enforcement officer for a few years, although in a large eastern city. In order to get the feel of a Western County Sheriff’s job right for his books, he shadowed a Sheriff friend of his back in Wyoming. If you have watched “Longmire,” the TV show on A & E, you have met the Sheriff in the persona of Robert Taylor, the Australian actor who has captured the depth and pain of Longmire perfectly. The other actors in the show, most notably Lou Diamond Phillips, Katee Sackhoff, and Bailey Chase, are marvelous in their roles. Please visit www.craigallenjohnson.com to learn more about Craig Johnson and his NYT bestselling, award-winning novels.